These cable suspension kits aren't your average sign supply. When you think of a store sign, what's the first thing that comes to mind? A poster frame? Or an outdoor A-frame sidewalk display? We've got a different style here for your consideration. 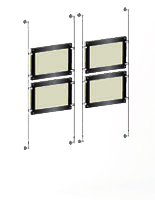 Hanging displays, cable suspension kits with acrylic frames use wires and visible hardware to attach to the wall. The hardware and included acrylic frames consolidate to give your display a light, almost invisible look that places the focus directly on your ads and posters. These cable suspension kits, such as the wire systems seen here, bring an architectural look to your store or office. Do you have an organization that's full of chrome, glass, and many other modern touches? The European design of these displays will be a great match for those contemporary furnishings, from matching the display tables to the ceiling lighting systems and more. These wall-mounted cable suspension kits that are for retail use comes with all of the tools you need to create a complete display. Everything is mailed to you in one convenient package for some of the easiest installation around. What parts do you receive when you order one of these cable suspension kits? Acrylic frames. 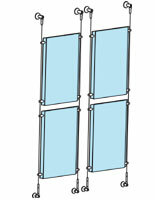 You can choose a kit that contains anyplace from a single panel frame all the way up to eighteen (18) image holders. These frames are made from precision laser cut acrylic for clean lines, and feature a top loading, fold over design to make changing and updating ads and other images a quick task. Choose from the following sizes to create your systems: 8.5"w x 11"h, 11"w x 8.5"h, 11"w x 17"h, 17"w x 11"h, 18"w x 24"h, and 22"w x 28"h.
Aluminum hardware. Aluminum is equally strong as stainless steel, but comes at a more affordable price. The wall mounts and panel gripper are both crafted from aluminum and have a satin silver finish to continue that modern styling. Amount of hardware in each kit is dependent on the amount of panels ordered. 16ft lengths of wire. The stainless steel cord is 1.7mm thick and has been coated in plastic to protect from fraying. All of these parts consolidate to make a display that offers you a truly light and airy look. The hardware can blend into the background and place your advertisements front and center, helping to ensure that customers and passersby sit up and take notice. These showcases are also great options for associations where floor space is at a premium. Floor stands with advertising posters have a tendency to take up a great deal of space with their large footprints and tall heights. Wall-to-wall models extend only a few inches off the wall, and require no floor space at all in order to be displayed. You'll be able to keep your sales floor neat and clean, freeing up space for additional merchandise or for your customers to maneuver around. These systems also provide you with good value for the money. There's a wide variety of price points in this category, allowing you to find the display that works best with your operating budget. 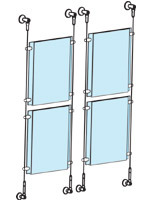 Why choose a hanging display system with panel grippers? These systems have some of the easiest installation around! Hanging frames can be set up in a matter of minutes, allowing you to start using them almost as soon as you take them out of the box. Changing your images is equally as easy. Just pull the front part forward and slide the updated sign right in. 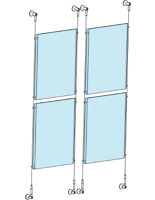 Because the panels are made from clear acrylic, they can also be used as a double-sided display if used in front of a window. You get double the advertising space for the cost of one sign! Want to expand your advertising display? Our e-catalogue has the accessories and individual components to these hanging kits for sale separately for equally as affordable prices. Add a brochure holder or a two (2) image holder to create a truly custom design. These systems create high impact through high visibility. And when customers and passersby take notice of your signage your incoming traffic is increased, which also helps to drive up sales. These wall mounted displays can be found in a wide variety of locations. They're becoming more and more popular in art galleries, giving them a modern and unique way to display paintings, sketches, and other print art. Real estate agencies are a common place to spot these, exhibiting rentals and purchases in the window of their shop for customers to take a quick look at as they're walking by. Universities and other schools use these to create modern classroom displays, showcasing signage while keeping it protected. You may see one of these systems in the entryway of a restaurant, supporting the menu and daily specials for customers to take a look at while they're waiting for their table. And, of course, they're frequently found in many retail stores and associations, containing promotional materials and advertising upcoming sales and specials.